Enjoy cocktails and light hor d’oeuvre while getting to know Andrew Quitmeyer, Genevieve Erin O’Brien, John Craig Freeman, Sara Dean and Beth Ferguson. Learn about each artist’s practice, AAI location and social issue to be addressed, the artist’s proposed approach and project concepts, and more about the American Arts Incubator program! The American Arts Incubator is developed in partnership with the U.S. State Department’s Bureau of Educational and Cultural Affairs. The program uses digital and new media to promote cross-cultural collaboration, increase awareness, and provide innovative solutions to pressing challenges. These artists will travel to their assigned countries for four weeks to develop public art projects. During such time the artists will lead workshops to teach specific skills, develop project ideas with community participants, and execute a micro-grant program to fund the development of community driven art projects. 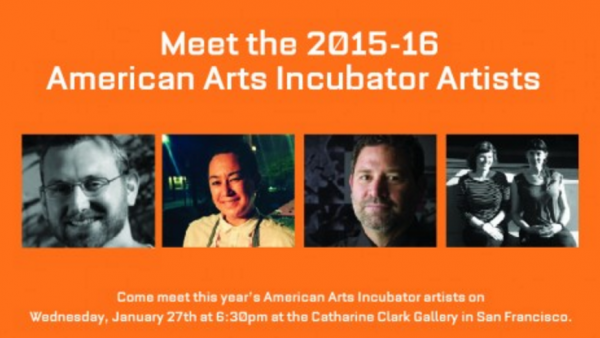 Learn more about the American Arts Incubator here! This event is free and open to the public, but we’d love to know you are coming. Please RSVP here.